Are you a Mac user that needs to access a Internet Explorer or PC only website? It happens, some websites require users to have Internet Explorer or a Windows PC before they will load, often these websites are for banks, governments, utility services, or even media services, and they have limitations to require a PC or Internet Explorer. Obviously this PC-only requirement can be an issue for Mac users, since the Mac is not a Windows PC, but nonetheless it can be necessary to view websites that require a Windows PC or Internet Explorer from a Mac anyway. 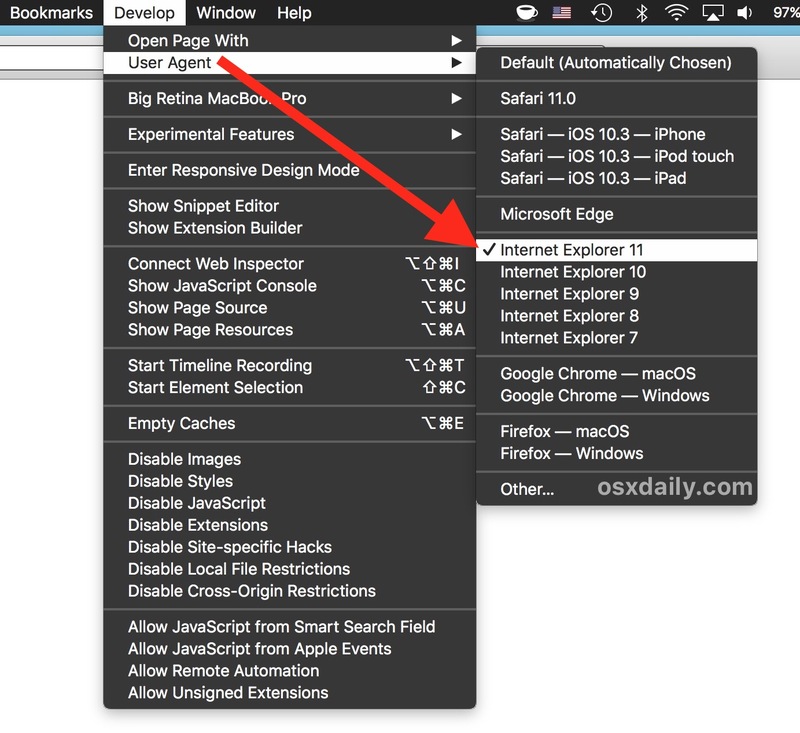 Don’t fret Mac users, with an easy trick you can gain access to websites that are Internet Explorer only, right from your Mac, even if you don’t have a Windows PC. The secret? Make your Mac pretend it is an Internet Explorer PC, thereby accessing the PC-only website right from Mac OS. This originates from a little web developer trick, and it’s quite easy to setup on your Mac with Safari. That’s all there is to it! How this trick works is that it changes what’s known as the User Agent identifier of the Safari and Mac web browser, fooling the target website into thinking your Mac is a Windows PC with Internet Explorer instead. Web developers use this functionality frequently for compatibility testing, but it has many other applications for accessing PC only and Internet Explorer only websites from a Mac, like some banking sites and bureaucratic websites, or various other websites that limit access to Windows PC and Internet Explorer. And once you switch back to the Safari or Default user agent string, you can also use Google search for “check user agent” to find that the Mac and Safari (webkit) user agent is detected again. Just remember to set your Safari user agent back to the default setting again once you are finished accessing the Internet Explorer only website on the Mac. 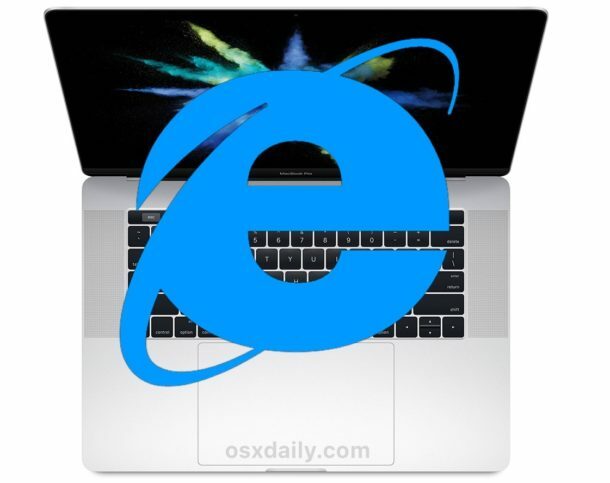 Are there other ways to get Internet Explorer on a Mac or access Windows PC-only websites on Mac? Enjoy running Windows or Internet Explorer on your Mac, or just enjoy accessing those Windows PC only websites on a Mac and make your Mac pretend to be Internet Explorer instead, whatever works for you! 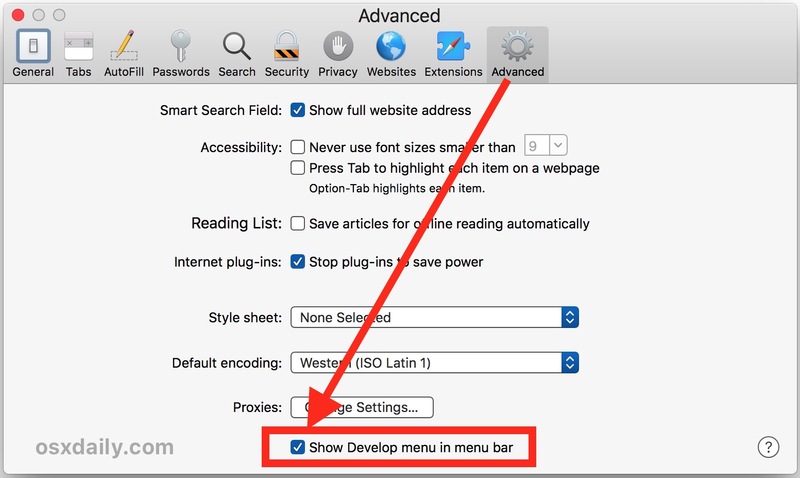 Note this method works on just about every version of Safari on every version of MacOS or Mac OS X, there are no modern version limitations on this trick to pose the Mac as a Windows PC with Internet Explorer. Happy browsing!